"Eat your vegetables!" may be a common refrain of parents everywhere, but even after we grow up and leave home, it's often a life-long struggle for many of us to get in adequate amounts of fresh veggies. Nutrition is my field of expertise. I know how to, and love to prepare and eat healthy foods. HOWEVER, that doesn't mean it's always easy to do. 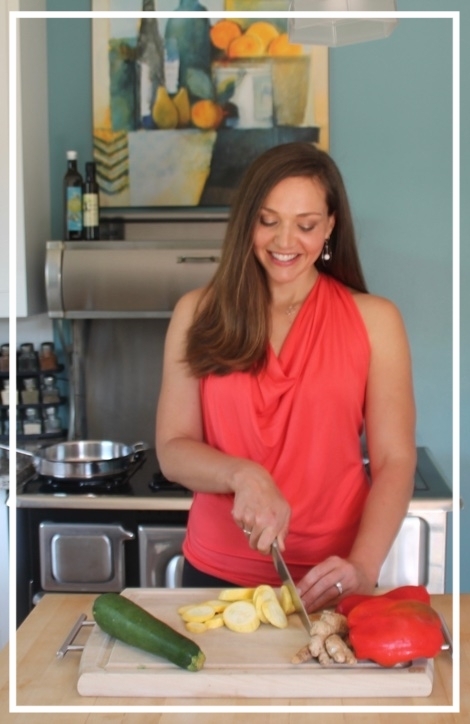 For me, and many of my clients, long days, low motivation, picky eaters, and plain old life can easily get in the way of prioritizing healthy homemade meals. Cooking takes time, and time is a very hot commodity these days. Luckily, there are more avenues available to us now than ever before that make cooking veggie-rich, nutritious meals at home more approachable, realistic, and a more sustainable practice. Think frozen, canned, pre-washed, pre-chopped, pre-portioned, boxed, home-delivered, vacuum sealed, etc. Are all of these convenient avenues nutritious? Not by a long shot. Many contain preservatives, unpronounceable ingredients, rich, sugar laden sauces, and many other additions we may not want in our meals. There are, however, certain ways to choose and use convenience foods to your advantage for quick meal options. 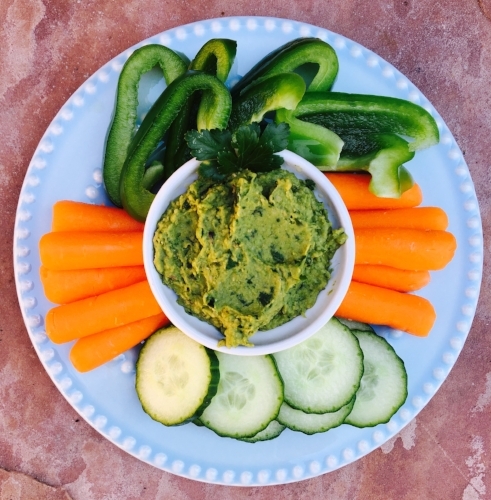 In my opinion, the number one convenience food out there is...drumroll, please.....fresh, ready-to-eat VEGGIES! More veggies?!?! But that means more frequent shopping, washing, chopping and cooking! And what happens if you don't get around to all that washing, chopping, and cooking before the veggies go bad? More wasted money and food...and the side of guilt that comes along with wasting. Well, guess what, this scenario just does not have to play out anymore. Enter San Miguel Produce's new line of pre-washed, and pre-chopped Juicing NuGreens! These generous single-servings of those dark green leafy veggies you're always being told to eat more of for better health are just about as convenient AND nutritious as it gets. 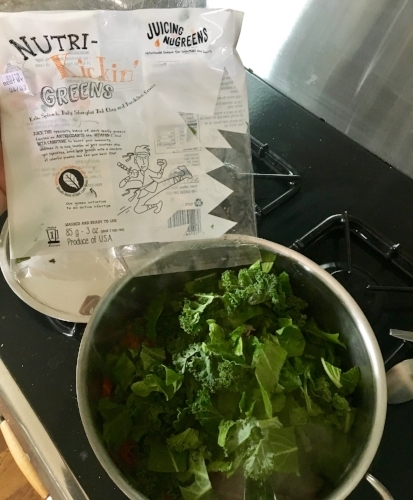 I had the opportunity to exercise my creative freedom with NuGreens and I'm here to share my discoveries so you can try them out and benefit from them as well! So, what makes these NuGreens so special? NuGreens are hearty, dark leafy greens. The dark colors, as with all fruit and vegetables, are an indicator of the high nutrient content they contain. With 3 different blends of greens (all grown in my home state, California! ), there are a so many possibilities to meet your veggie quota every single day in almost every way! These vitamin and mineral packed powerhouses are packaged in single-serving bags, so you won't be tempted to skimp on your veggie serving size. Just toss the whole bag into whatever dish you're making and forget about letting the remainder of the bag go to waste. If you still can't seem to make use of them before they go bad (sadly, fresh food free of preservatives does not last forever, friends. ), just toss them in the freezer, bag and all! They freeze perfectly well and can then be used frozen when you're ready. Add them into a smoothie, soup or other dish that requires cooked or mixed in greens. Like all frozen veggies, they don't thaw out to quite their original fresh, crisp form and might not be the ideal texture for a raw veggie salad. I froze a few bags from the stash pictured above and plan to add them to a soup and one of my breakfast veggie egg bakes in the near future. 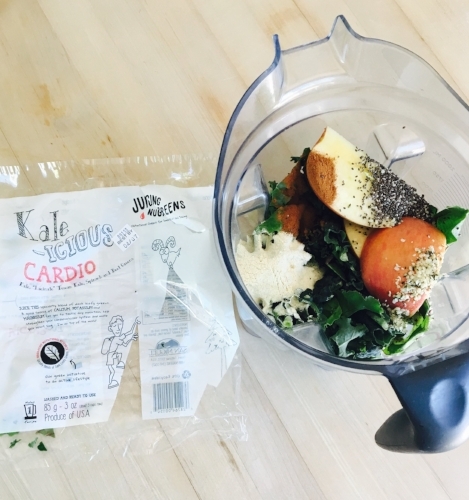 This blend of kale, Lacinato Tuscan Kale, spinach & beet greens provides a good source of calcium, potassium, and magnesium, all of which support cardiovascular health. Who doesn't love a strong, healthy heart!? I used this blend in my Sweet Apple, Vanilla & Greens Smoothie! Click here for the recipe for this smoothie and a few of my other concoctions. They are all wonderful with a bag of NuGreens added to them. Because these greens are washed & ready to use, you can just open and toss the entire bag into your blender with other smoothie ingredients. This works well with those bags you've already frozen, too! No more greens gone bad. 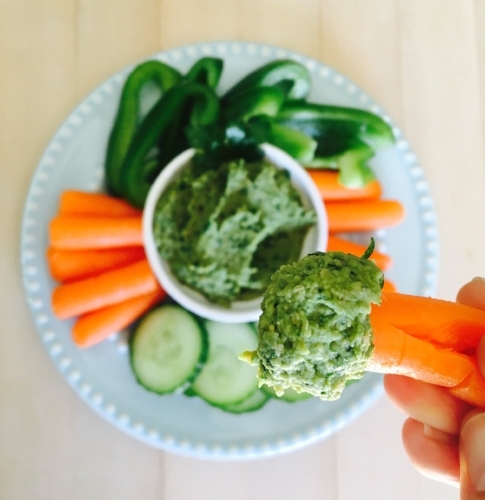 Next up: HUMMUS - another effortless way I added this blend and a heaping helping of veggies to one of my daily staples. One bag in the blender with the rest of my typical hummus ingredients, and voila, a beautiful new color, flavor, and seriously upgraded nutrition profile! Delicious AND nutritious! Kale, spinach, Baby Shanghai, Bok Choy and Dandelion Greens are all loaded with antioxidants Vitamin C and Beta Carotene, which your body turns into Vitamin A. These nutrients help maintain a healthy immune system. Yes please! With the asian greens Shanghai and Bok Choy in this blend, the first thing that came to mind was a quick stir fry. I just sautéd a couple other veggies I had on hand, then tossed in a bag of Nutri-Kickin' Greens with shrimp, and voila! Dinner in under 20 minutes. I'll take that any night of the week! Kale, Spinach, Collard and Dandelion Greens are rich in folate, calcium, and potassium. Many of us don't get adequate amounts of these basic nutrients in our diets. Shoring up nutrient deficiencies is one of the first, most basic ways to really make sure all systems in our bodies run like well-oiled machines. Know any pregnant mom's focused on getting adequate folate to avoid neural tube defects in their babies? Green leafies like this are an excellent source of folate! I know all too well that while our intentions are good, with low energy and nausea, pregnant moms are not always excited about washing, trimming and prepping veggies! That's when conveniences like these ready-to-eat greens save the day! My quick and easy, balanced breakfast using this blend: One-pan eggs, greens & sprouted grain toast. I literally put eggs in a pan, dumped the entire bag of greens on top, covered it, and let the eggs cook and the greens wilt a bit on top of them. Pan to plate in 5 minutes flat. Veggies, protein, healthy fats and carbs - check, check, check, and check! Now THIS is a powerful way to start the day! Still worried about that whole veggies going bad/food waste thing? Fret not. San Miguel picks, washes, slices and packages greens just before they hit store shelves. To add to the fresh factor, they use packaging that allows the gases the greens emit to escape from the bag, rather than being trapped inside, helping them stay fresh much longer than your typical bagged greens. Moral of the story: Look for these greens at your local grocery store and try them out! If they don't carry Juicing NuGreens yet, ask the produce department to start stocking them, stat! What are your favorite ways to fit greens into your diet? Let me know if you want any suggestions to incorporate them even more! I like to recommend my clients consume a "therapeutic dose" of colorful produce on a daily basis. This is a sponsored post. It was written by me on behalf of San Miguel Produce. All opinions are 100% my own.